The initial idea of playing down to a winner just got changed. We are playing one last level, and if there's not a winner by the end of it, we will return tomorrow to play it out. A 20-minute break was announced, but the players negotiated that down to ten minutes. Gavin Griffin was caught bluffing on the river of a board. 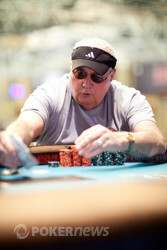 Herbert Tapscott checked to him and called the 160,000-chip bet. "Ten-high. 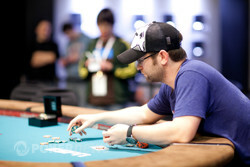 Nice call," said Griffin when he saw his opponent's for a flush. Whatever happens we are going to play down to a winner tonight. That is the information we just got from the tournament director. The limits are huge and it could all be over in a matter of hands, but with the current pace it could also still take a couple of levels. Griffin limped from the button and Tapscott raised. Griffin followed with the quick call and the flop brought out . Tapscott bet 80,000 and Griffin made the call. The turn was the and Tapscott bet 160,000, Griffin called again. On the river showed up and Tapscott checked. Griffin bet 160,000 and Tapscott called saying, "Nice catch", and Griffin showed for the nut straight. Tapscott had and mucked his top set. 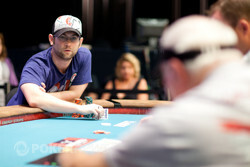 Gavin Griffin threw his cards into the muck on the river prompting one of his railers to shout, "Shake it off, Gavin." 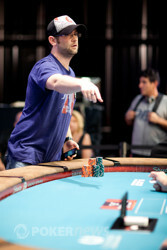 Griffin had limp-called a raise from Herbert Tapscott to head to a flop. Tapscott led for 80,000. Call. The turn came and Griffin called an 160,000 bet before both checked the river. Tapscott opened up and scooped. 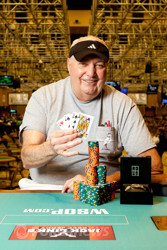 Herbert Tapscott is on top of things as he just won another important pot. Tapscott raised to 160,000 from the button and Griffin called. The flop came down and Griffin check-called 80,000. 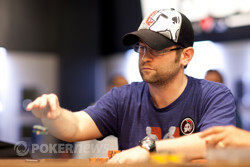 The turn was the and Griffin checked again after which Tapscott bet 160,000. Griffin decided to raise making it 320,000 and Tapscott called. The river was the and Griffin bet 160,000. Tapscott called and Griffin showed for trip eights with a nine but his kicker was beat by Tapscott who showed . Tapscott increased his lead and is looking very strong at the moment. 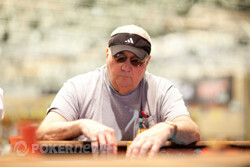 Herbert Tapscott has had the better of the first few heads-up pots. They're not exciting or big enough to write about but they have seen Gavin Griffin slip further behind.